Caught in a ‘spring’ blizzard along the rim of Crater Lake, I was fully unprepared for the full brunt of winter to come howling out of the west. The sky a white canvas of snow and visibility to a minimum I had to make a choice: continue on in hopes of finding a sheltered campsite or hike back to basecamp and try the rim trail the following day. As I struggled with my predicament, one thought blazed through my mind, “A good photograph is knowing where to stand.” Decision made, I pushed forward through the snow and winds, making camp on the very rim of the crater. Awakening to blissful silence and a light glow permeating my tent, I stumbled outside to see the sky aflame with pre-dawn’s light. 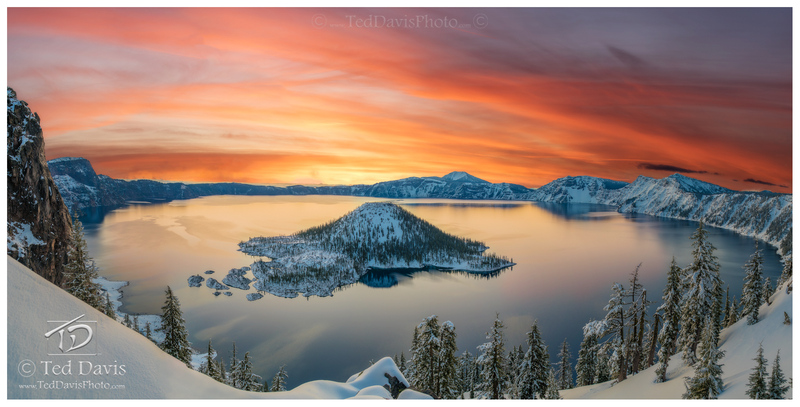 It took but an instant scrambling along the rim to find the composition – to set up a panoramic capturing Wizard Isle and the beauty of Crater Lake. Photo © copyright by Ted Davis.